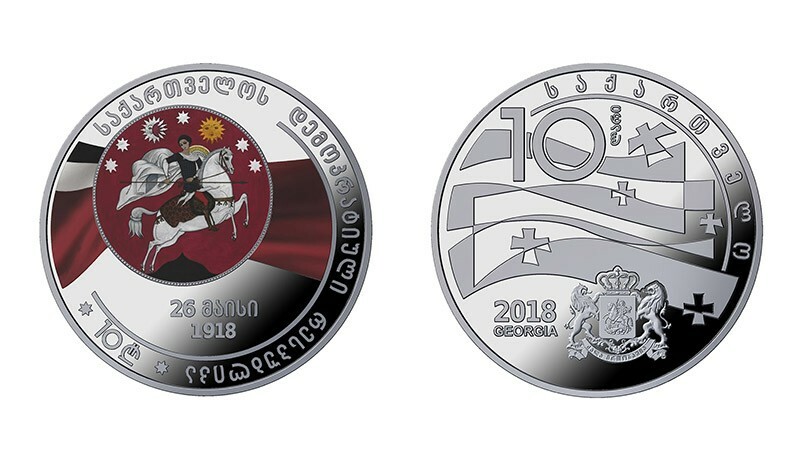 The National Bank of Georgia have unveiled (21st March) the design of their forthcoming collector coins which will be issued in remembrance of the country’s declaration of independence, which occurred on the 26th May 1918. Prior to the Georgian declaration, the small nation in the Caucasus had become part of the Russian Empire after the kingdom had been annexed by Czar Paul in 1800, later confirmed by his successor Czar Alexander I in 1801. With the abdication of Czar Nicholas II in March 1917, owing to the defeat of Russian imperial soldiers during the fighting in Europe, the Transcaucasian Democratic Federative Republic was established with Nikolay Chkheidze (1864–1926), a Georgian politician, acting as its president. The federation consisted of the three nations of Georgia, Armenia, and Azerbaijan. As Turkish Ottoman troops were advancing into the Caucasian territories of the crumbling Russian Empire, Georgia declared their independence on the 26th May 1918. Unfortunately for the newly proclaimed republic, its status as an independent country did not last long, and by early February 1921, during the Russian Civil War, the Red Army advanced into Georgia and brought the local Bolsheviks to power. The newly established Georgian army was defeated and the Social Democratic government fled the country on the 25th February 1921. The Red Army entered Tbilisi and established a soviet form of government. Georgia was incorporated into the Transcaucasian Socialist Federative Soviet Republic, alongside Armenia and Azerbaijan, in 1921 — which in 1922 would become a founding member of the Soviet Union. It is noteworthy to mention that an ethnic Georgian was born on the 18th December 1878, as Ioseb Besarionis Dze Jugashvili (იოსებ ბესარიონის ძე ჯუღაშვილი) in the town of Gori, and became a prominent leader among the Bolsheviks. He was more commonly known to the world as Josef Stalin. Stalin would rise to the highest position, becoming a ruthless leader of the Soviet Union from the 3rd April 1922, until his death on the 5th March 1953. Georgia would not be recognised as an independent nation for nearly 70 years until just before the eventual and official fall of the Soviet Union in December 1991. Independence was once again sought after a referendum on the 31st March 1991, with an official declaration being made by the Georgian Supreme Council on the 9th April 1991. The coin is produced by the Fabrica Nacional Moneda y Timbre Real Casa de la Moneda at their facilities in Madrid, Spain, on behalf of the National Bank of Georgia and is designed by Mamuka Gongadze. 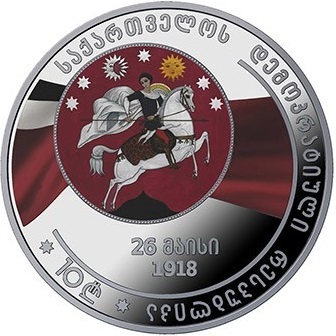 The obverse depicts a fluttering national flag and state emblem — the heraldic symbols of the Democratic Republic of Georgia from the years of 1918-1921. The following inscriptions are also included: 26 მაისი 1918 (“26th May 1918”), საქართველოს დემოკრატიული რესპუბლიკა (“Democratic Republic of Georgia”), 10 ₾ (“10 Lari”). 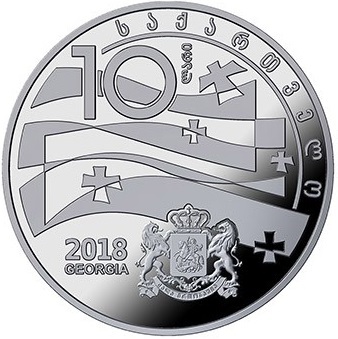 The reverse side features stylised renditions of Georgia’s more recent state and heraldic symbols — the flying flag and the coat of arms of Georgia — which are the main components of the design. The following inscriptions are also placed: საქართველო, 10 ლარი, 2018, and GEORGIA. The coin is encapsulated and presented in a custom case along with a certificate of authenticity. Sales of the coin will commence on the 15th May 2018, and it can be purchased directly at the National Bank of Georgia’s Cash Centre and Money Museum. The coin can also be purchased via the Money Museum’s website.